Cingor is a Bosmer crusader living in Leyawiin. He is a member of the Fighters Guild, although he never sets foot in the local guild hall. He is also a Mythic Dawn sleeper agent, and will attack you on sight after the Dagon Shrine quest. He is the self-styled Captain of Leyawiin's neighborhood crime-watch team, dedicated to stamping out all crime that the guards overlook. Unfortunately, he is also the only member of the team, but that doesn't stop him from being very dedicated to his duties. Every single day he gets out of bed at 6am and start patrolling Leyawiin for potential lawbreakers, his preferred areas being the eastern and southern parts of town and the stairway leading to Blackwood Company. He keeps patrolling for a whopping sixteen hours, having taken a two-hour lunch break in the Three Sisters' Inn at noon. At midnight he finally goes home to sleep. The only exception to all his hard work for the community will be when it is raining. On those occasions, he will break off his duties and head back to his house until it clears up. When you meet him for the first time, he will introduce himself and his mission in life: "I'm Cingor. I'm the Captain of the Leyawiin Neighborhood Watch. Actually, Captain, President, Vice-President, Secretary, Treasurer, and Sergeant-at-Arms. We're a small, select organization of crime fighters. We're going after the crimes and criminals the Guard overlooks." About the city of Leyawiin, he has the following observations: "There's crime everywhere! I'm always on the lookout... ehr... WE're always on the lookout. No crime shall go undetected! That's our motto." When on duty, he wears an iron cuirass with huntsman leather pants and matching moccasins. When he is in his house, he will unequip the cuirass and put on a huntsman vest instead. He carries whatever clothing he is not wearing, his house key, and a small amount of gold. He wields an iron warhammer and can cast two Destruction spells (one minor, one major) and a major Restoration spell. If you are also a Fighters Guild member, it is possible that Cingor's disposition towards you will be high enough that he will not attack when all the other Mythic Dawn agents turn hostile. If he does however, it is advisable for Fighters Guild members to abstain from direct combat with him, so as to avoid expulsion from the Guild. 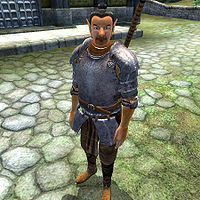 This issue has been addressed by version 3.4.0 of the Unofficial Oblivion Patch; he will be removed from the Fighters Guild after the quest Dagon Shrine. Cingor is the only Mythic Dawn agent who cannot cast their standard bound armor and weapon spells.